Would you like to be more productive and feel better fast? Consider starting your day with a morning massage. The goal of a morning massage is to make your body feel and perform better throughout the day by getting out the kinks caused by a “good” night’s sleep and the soreness and stress caused by a “bad” night’s sleep. People often wonder when is the best time to get a massage. There are some mixed opinions as to whether a morning massage is better than an evening massage, however, one thing that you can’t deny is that massage is good for you any time of the day. Waking up in the morning stiff and sore is no fun. A massage can help loosen up those tight muscles and stiff joints. Here are some of the great benefits of getting a massage in the morning. Muscles and joints can tighten up for many reasons. Some of these include injuries, poor posture, bad sleeping positions, and more. Regardless of the cause, massage in many instances helps with tight muscles and stiff joints. Many people make a morning massage a part of their everyday routine. For many individuals, a morning massage helps decrease physical and mental stress that can lead to more problems in the long run. Starting your day with less stress can have many physiological and psychological benefits. Waking up and starting your day with a great massage may just be the thing you need to enjoy a great day. 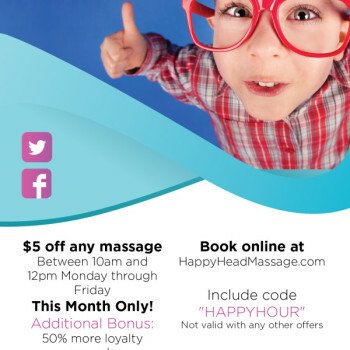 For the month of August 2016, get $5 off any massage before 12pm Monday through Friday. As an added bonus clients will also get 50% more loyalty rewards points. To score this awesome deal, book online and use code “HAPPYHOUR” in the discount code section. The Happy Hour promo is valid only Monday through Friday before 12pm and is not valid with any other offers. Start considering a morning massage. Even a short massage in the morning can help you feel great the rest of the day. Happy Birthday To You! Not Yet? Don’t Miss Out On Happy Head’s Awesome Birthday Deals!